There’s no evidence that anyone from Henry Hudson’s expedition was any closer to the Berkshires than the Hudson River. But it is very likely, tales of the wondrous craft, “a great floating bird,” seen going up the Hudson as far as Albany would have spread like wildfire among the various tribes living anywhere near the river in the early 17th century. There also might have been enough contact tp touch off the small pox epidemic that had decimated tribes on both sides of the river by 1he 18th century. 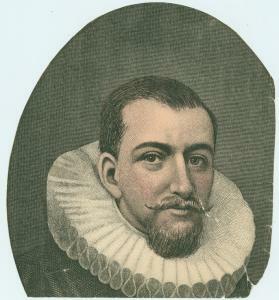 Based on information from Verrazzano (sailing for France) and Hudson’s friend John Smith as well as his own earlier voyages Henry Hudson (an Englishman) signed a contract with the Dutch East India Company to seek a passage to China by going around the northernmost part of North America. He left Holland in 1609 on the 85 foot Half Moon and headed north. Upon being blocked by Arctic ice north of Newfoundland he headed south. He is thought to have gone as far south as Cape Hatteras but not stopped at Jamestown River because he was flying under Dutch colors and because further south he would start being in Spanish territory. His logs suggest was close enough to the Chesapeake Bay, the Delaware Bay, and the barrier islands to have had long and admiring looks. His first anchorage in New York was at today’s Staten Island. Shirley Dunn in The Mohicans and Their Land 1609-1730 said that Robert Juet’s journal from the Half Moon described a people with “friendly attitudes, a complex social organization, ample food supplies, a peaceful lifestyle, and extensive territory at the moment of European contact. Most of the “River Indians” lived in long houses or wigwams, made from bended saplings covered with tulip tree bark. They planted corn, squash and beans which supplemented their diet of fish and game. In initial meetings the Indians were quite welcoming to the newcomers. However, up river, the crew took Indians captive and shot two for stealing. The voyage down river was understandably less friendly. Verrazano had seen and noted the New York harbor but Hudson was the first to penetrate the coast – managing to sail 140 miles up river and return. 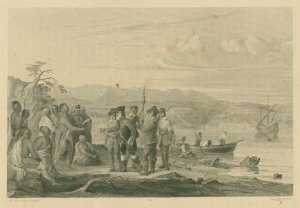 We can only imagine what would have gone through the minds of the original inhabitants on seeing the 17th century equivalent of a spaceship from another world or the reaction of the Europeans on seeing the trees, waterfalls and teeming waters of the unspoiled Mahicanituck (a Mohican name for what is now known as the Hudson River).